Bugaboo have released details of their new Bugaboo Bee5. The first question to answer is why the numbering of the Bee skips from 3 to 5? This is because adding the 4 to the Bee forms a word which will offend the Chinese, so Bugaboo decided to not cause offence and skip the number four. At first glance the Bee5 does not look like it has not changed much – it still looks very similar to the current Bee 3. However, there have been over 100 new parts put onto the pushchair, and it will be more customisable. There will be more colours than previously; removable wheel caps and leather-look handlebar covers which can be swapped. There are three fabric colour collections: Core, Premium and Signature. The Core Collection has bold basic colours. The Premium Collection will have muted melanges. The Signature Collection offers beautiful prints. These have a different price point. The wheel caps come in Dark Red or White. There have been apparently over 100 new to the pushchair to improve it. There is an improved seat design; new tyre design; an improved push; new integrated attachment points for accessories; new changeable leather-look handlebar covers; a new pocket in the basket; and new laser etching on the side of the handlebar for the ‘unfold’ marker. The Bugaboo Bee5 will be in store from March 1st but is available to order now from all Bugaboo stockists. 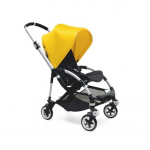 The Bugaboo Bee5 Premium Collection model – pushchair with seat and melange sun canopy- Prices start at £566 for example for an aluminum chassis with blue melange fabrics and rise to £719 for a black chassis with grey melange seat and sunrise yellow sun canopy. The bassinet price varies from £100 to £140 depending on the choice of fabric. It is not an easy price structure so check that you get a quote before ordering.